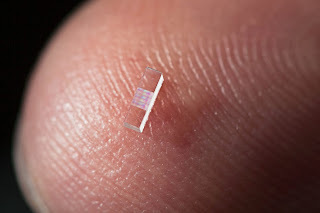 SLAC and Stanford scientists used nanofabricated chips of fused silica just three millimeters long to accelerate electrons at a rate 10 times higher than conventional particle accelerator technology. Scientists from the U.S. Department of Energy's (DOE) SLAC National Accelerator Laboratory and Stanford University have developed an electron accelerator the size of a grain of rice using nanotechnology and ultrafast lasers. A particle accelerator accelerates and propels subatomic particles at very high speeds. Electric fields are used to increase their speed while magnetic fields contain and control their direction. There are two kinds of accelerators; linear accelerators and circular accelerators. A Linear accelerator directs particles from one end to another. They are usually used to hit surfaces of objects with the particles. A cathode ray tube (like the ones in a television screen) can be an example of a linear accelerator. Electrons are sped up and hit the tv screen to form an image. The circular accelerators allow particles to travel around a loop continously. They are used to collide two particles, each going in opposite directions. The Large Hadron Collider is an example of a circular particle accelerator. Practical applications for particle accelerators aside from cathode ray tubes, x-ray generators and ion implanters (machines used to manufacture integrated circuits). A new medical technology called proton therapy or particle therapy use particle accelerators in the treatment of cancer. In an advance that could dramatically shrink particle accelerators for science and medicine, researchers used a laser to accelerate electrons at a rate 10 times higher than conventional technology in a nanostructured glass chip smaller than a grain of rice. The achievement was reported today in Nature by a team including scientists from the U.S. Department of Energy's (DOE) SLAC National Accelerator Laboratory and Stanford University. "We still have a number of challenges before this technology becomes practical for real-world use, but eventually it would substantially reduce the size and cost of future high-energy particle colliders for exploring the world of fundamental particles and forces," said Joel England, the SLAC physicist who led the experiments. "It could also help enable compact accelerators and X-ray devices for security scanning, medical therapy and imaging, and research in biology and materials science." Because it employs commercial lasers and low-cost, mass-production techniques, the researchers believe it will set the stage for new generations of "tabletop" accelerators. At its full potential, the new "accelerator on a chip" could match the accelerating power of SLAC's 2-mile-long linear accelerator in just 100 feet, and deliver a million more electron pulses per second. This initial demonstration achieved an acceleration gradient, or amount of energy gained per length, of 300 million electronvolts per meter. That's roughly 10 times the acceleration provided by the current SLAC linear accelerator. "Our ultimate goal for this structure is 1 billion electronvolts per meter, and we're already one-third of the way in our first experiment," said Stanford Professor Robert Byer, the principal investigator for this research. Today's accelerators use microwaves to boost the energy of electrons. Researchers have been looking for more economical alternatives, and this new technique, which uses ultrafast lasers to drive the accelerator, is a leading candidate. A collaborating research group in Germany, led by Peter Hommelhoff at the Max Planck Institute of Quantum Optics, has been looking for such a solution. It simultaneously reports in Physical Review Letters its success in using a laser to accelerate lower-energy electrons. Applications for these new particle accelerators would go well beyond particle physics research. Byer said laser accelerators could drive compact X-ray free-electron lasers, comparable to SLAC's Linac Coherent Light Source, that are all-purpose tools for a wide range of research. Another possible application is small, portable X-ray sources to improve medical care for people injured in combat, as well as provide more affordable medical imaging for hospitals and laboratories. That's one of the goals of the Defense Advanced Research Projects Agency's (DARPA) Advanced X-Ray Integrated Sources (AXiS) program, which partially funded this research. Primary funding for this research is from the DOE's Office of Science.